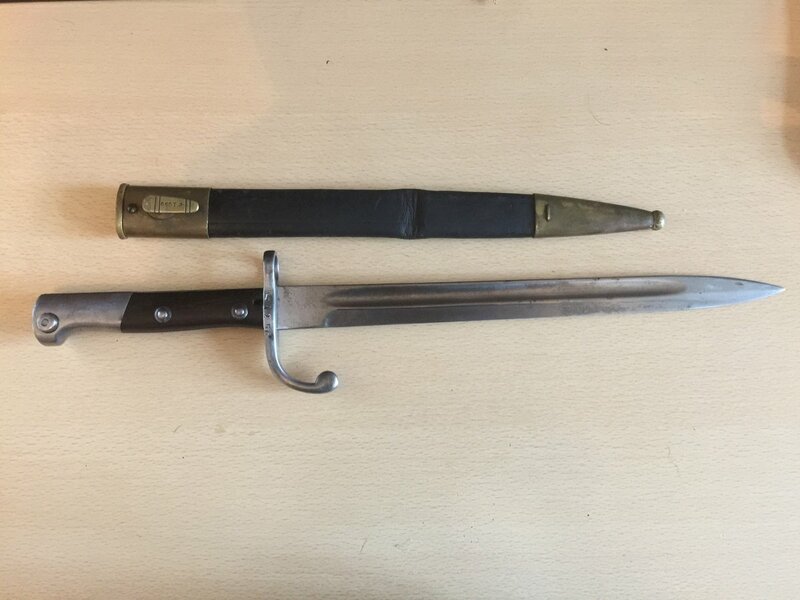 I have just aquired this bayonet,German made by Weyersberg .Kirschbaun & CIE Solingen i believe . I know that Brazil did not declare war on Germany until 1917,and they only sent a few officers and sargeants to France, but there navy did see some action. 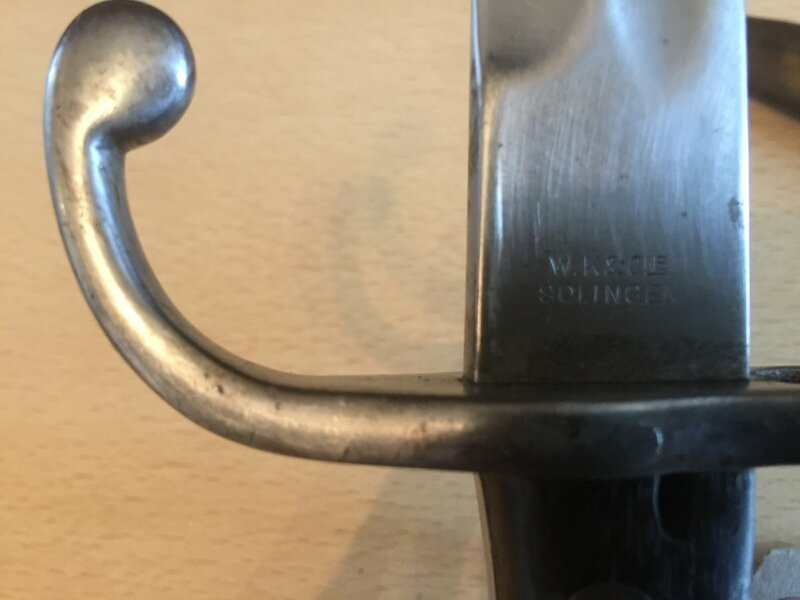 Does anyone know what the tear drop marking means on the back of blade,and the e on the scabard? I did not know Brazil was a combatant in the Great War, even if just their Navy. Do you know of any naval battles? if you google Brazil ww1, Wikipedia page has a lot of info on this. Britain obtained and issued Brazilian Mausers, much like the Chilean Mausers, from a warship under construction in the UK at the outbreak of war. 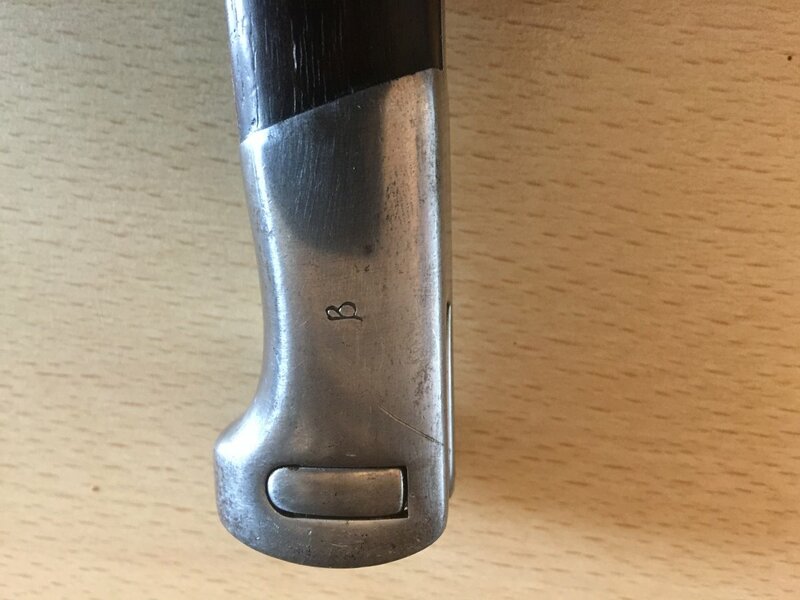 It appears 1908 Mausers (and it is assumed bayonets) had already been supplied to equip the ship (although the exact order of events is unclear) however the rifles appear to have passed to the Admiralty for emergency use (Ammunition being supplied by US manufacturers) There is/was an example in the MoD Pattern room. 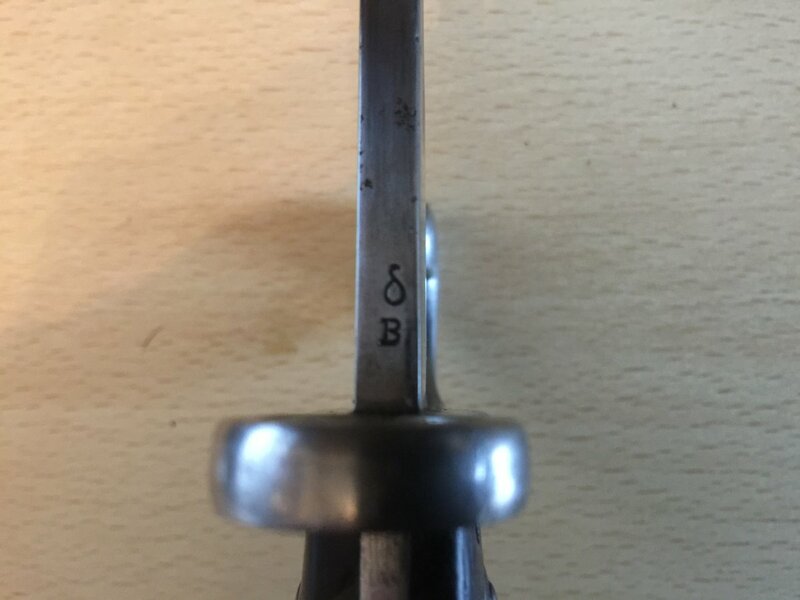 The symbol on the back of the blade is a cursive Greek letter 'delta', that on the pommel a cursive Greek letter 'beta', and I believe that these are Brazilian(?) inspector's marks. 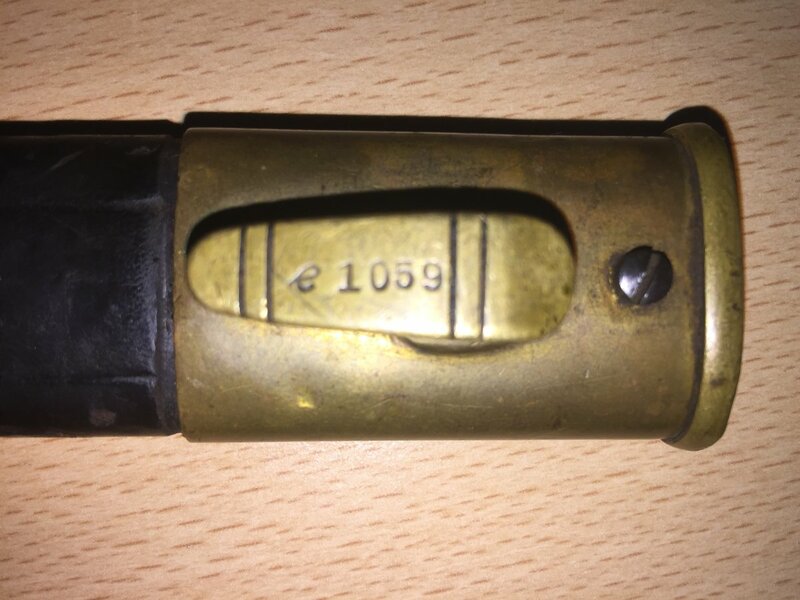 The frog stud marking 'e' is, I will make a guess, part of a consecutive series numbering system, The first 9999 were marked 'a', he next 9999 were marked 'b', etc. 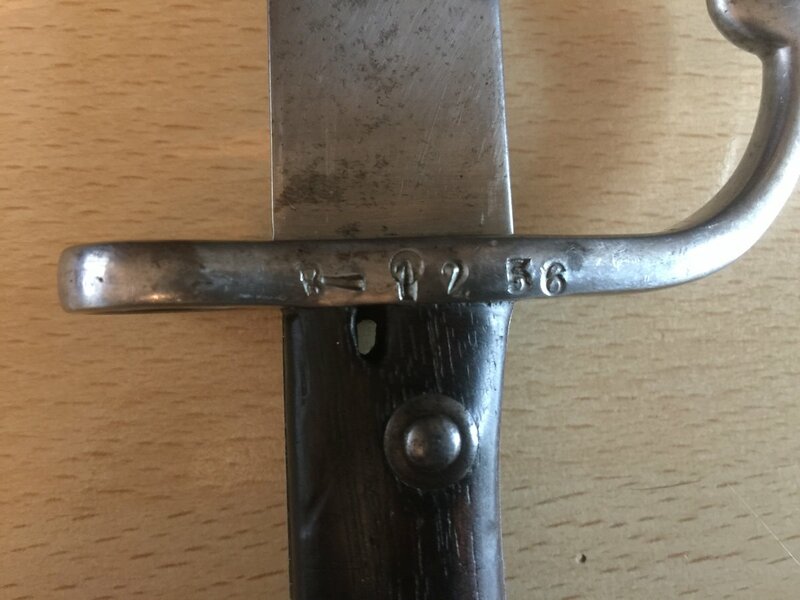 I have an exactly similar example, one side of the crossguard carries the serial number 6913, the other side a faint AG, no markings to the frog stud, the spine has the B mark, but no makers marks present at all. It was a cheap impulse buy at an antiques fair. They are a very good looking bayonet. The hilt and crossguard were rusty when I purchased it, as you say a combination of polished steel, brass, leather and walnut grips is hard to resist. 'still used for cerimonial occasions'. Reminds me of how until 20 or so years ago the Honour Guard of the German Republic was using WW2 Kar.98 and bayonets still with their 3Reich eagle waffenamt markings on them... And the WW2 German rifles and bayonets similarly marked an Israeli friend of mine trained with some 50 years back...! 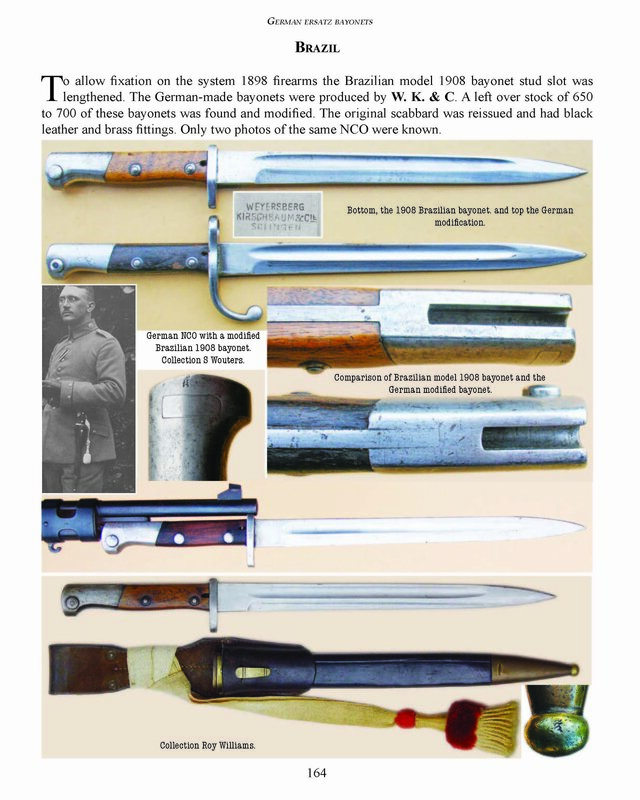 Some bayonets Brazil use by German during the first war. Do these converted ones have any marks on the blade spine? For example, a year mark, or fraktur?